This creamy soup is a wonderful way to prepare summer's most bountiful squash - zucchini. The flavors of fresh basil, chili powder, and yellow onion pair well with the zucchini. Serve with thick baguette slices and fresh sliced tomatoes for a simple, satisfying meal. Purée the soup in batches in a blender. Pour the soup through a strainer into a bowl, using a ladle to push any solid bits through. Add 2 tbsp. crème fraîche and 1/4 tsp. chili powder. Season with salt to taste. 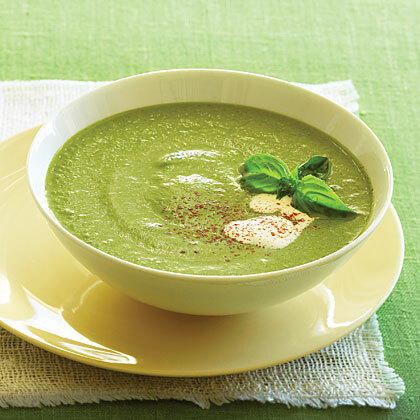 Divide soup among bowls and garnish each with some crème fraîche, a sprinkle of chili powder, and a few basil leaves. The Twist: Dress It Up. We love the simplicity of this soothing, mild soup, but to make it a little fancier, skip garnishing the soup with crème fraîche, chili powder, and basil in step 3, and instead halve 1 roasted red bell pepper, removing seeds and stem. Slice half into ribbons. Put the other half in a blender and purée with 1/2 cup crème fraîche or sour cream. Strain into a bowl, then drizzle over soup. Top with bell pepper ribbons and toasted pine nuts.